After you buy for first home, you may be overwhelmed by the seemingly endless jobs and projects that face you. From leaky sinks and faulty air conditioners to hanging up pictures and building furniture, you'll need a range of hand tools to tackle the many jobs that come up. If you're ready to put together your first toolbox, here's a look at the top 10 hand tools you'll need to have to maintain and fix your new home. A word of advice: look for high-quality tools in the beginning rather than cheap tools, as they'll be more reliable and last a lifetime. No one enjoys replacing broken or rusted tools! There are many types of hammers, although a quality 16-ounce claw hammer is perfect for general use around the house. This multi-purpose hand tool can drive nails into drywall or wood while the claw can be used to pull out bent nails or pry up boards. Pliers are useful tools that help you get a good grip on nearly anything, including bolts, nuts or small objects. Pliers come in handy for many DIY projects around the house, like switching out a rusted and leaking shower head. For your first set of pliers, make sure you get locking pliers, or vice grips, as well as needle-nose pliers, which are long and tapered. 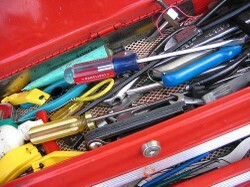 Other good pliers to have in your tool box include tongue-and-groove and slip-joint pliers. Need help picking out a set? Here's a buying guide for pliers. Screwdrivers are truly the most basic hand tools you need to perform everything from switching out cracked light switch covers to changing batteries in a child's toy. These tools are really invaluable and come in handy for nearly every task around the house. You'll find there are dozens of types of screwdrivers which are made to match specific screws. To start, look for a set that includes various sizes of Phillips and flat head screwdrivers. Consider investing in a ratcheting screwdriver and a couple of stubby screwdrivers for reaching those tough cramped spots. Whether you're measuring planks of wood to repair your porch or measuring walls to replace carpeting or place furniture, a tape measure is one of the most basic parts of your tool kit. Look for a retractable tape measure that measures a minimum of 25 feet. Tape measures include a hooked end that make accurate measurements easy when you don't have a second pair of hands. A cordless drill is something every DIY-er appreciates. While it may not seem like a necessity, a drill makes everything easier, whether you're assembling your own furniture, installing a curtain rod or hanging pictures on the wall. When you pick up a drill, make sure you get a set of driver bits as well. Plan to fix a dripping faucet or a clogged sink? What about radiator valves that are stuck and can't be turned by hand? The most important wrench for a homeowner is the adjustable wrench, which has a little wheel that lets you open and close the jaws of the tool to a wide range of widths. A good general purpose socket set will have a ratcheting handle, a huge selection of socket sizes and an extension bar to handle any job. This is one of those tools that you certainly won't use every day, but when you need it it's good to have. Like the measuring tape, a utility knife is a cheap yet indispensible tool for every homeowner. You'll find yourself reaching for a utility knife to pull up worn out carpet or opening shipping containers. Every now and then you'll find yourself needing to work in a dark environment, such as behind the washer and dryer or under the sink. If the circuit breaker trips, you may also need your flashlight to make your way in the dark to reset the breaker. Get a sturdy rechargeable flashlight for your tool kit that's always ready. Did you forget the tool box? You'll need something sturdy to store your new hand tools, so look for something that's durable with trays to organize your collection. While plastic tool boxes are cheap and affordable, consider investing in a metal box that won't crack. There you have it, the top 10 essential tools for every homeowner. While buying this collection of hand tools will set you back a bit, you'll be prepared to handle most jobs that come up around the house without calling a repairman or plumber. Invest in quality tools and you won't be sorry; these hand tools will last for decades and always be there when your water heater begins to leak or you need to replace a lighting fixture. Want mechanic hand tool sets built to last? Bovidix offers every tool you need to maintain your home, all made from high-quality Chrome Vanadium to last a lifetime. The new Multibox system revolutionizes tool storage, creating a system to store and transport your tools that's efficient, space-saving and durable. This list is so useful, thank you so much. I agree with Rose about the electric screwdriver, thanks for mentioning that. I recommend an electric screwdriver - they can screw and unscrew pretty much everything. Very handy if you are a woman without much strength.